Yes, that was my problem, I realised - too late. I'd grouped my garments too early in the sequence, I should have done it after the cloth room, not before. Well, nothing like your hours of work dropping into bits on the virtual floor to remind you not to do that again. The tutorial helped a lot, thanks. Everything in the right order :) I'm going to look at those other ones as well. I feel I can get my head round it now. That's M4 there, does he look like David? Yeah, I see what you mean. He's kind of small and skinny... lol, when I used David a lot, I spent forever trying to make him into beefcake. That's my character, Klaus Honey. He's a policeman. A new one. They don't have height restrictions any more. * A child of five could understand this. Fetch me a child of five! * Isn't it wonderful how cute weapons of mass distraction can be? * Those are my principles. And if you don't like them, I have others. Bless. Gum and everything. Hair straggle. Oh, and a lot of blood, I guess I should have noticed that first.... oops, sociopath index just went up a point or two. Hee. I remember this. Damian hadta come out after seeing this one. Does Iain still need that popped? XD! I should really re-do this one, in PP this time. I can't remember the last time I rendered out that psychopath. "I didn't attend the funeral, but I sent a nice letter saying that I approved of it. " Mark Twain. That's some glowy blood on Mister Damian! and glowy eyes, too. Mmm. Tasty. Nah. That was the point with the blood, for you to see Teh Kyute, and then say... Oh my, what has he been up to? Lighting. Composition. Set dressing. Oh yes. Very important. Yeah, hadn't had a good handle on posting blood yet when I made him. XD And I had forgotten, his eyes were supposed to be GREEN. Not Blue. Oi. I really, really should re-make him on M4. *squint* He's not one of your digital men? Hmm. He's M3 is he? He looks crazy in a different way. More upfront. Less amused about it. I like the juxtaposition of the two seemingly unrelated items. As I recall, this particular event was not a festive one for Ian, just a bit of work that came in before he got his dance clothes off one evening. And yes, the juxtaposition was entirely intentional. Damian, on the other hand, was out partying in the worst way. :) Getting on his Boogeyman. Yes, Damian is truly a psycho/sociopath in the "best" ways. One of his hobbies is collecting teeth from his victims for one of his brothers to make a shirt out of. Don't ask. He's one of a set of triplets, actually. And, no- I never made him into my M4 series because he is- yes- M3. I've been hedging on making one for M4. I adore this little (Six foot three little) psycho but every time I took a jab at it I've just not hit it right. Noggins is having a sale! The Zebrats are on sale! Whoopeeeee! I got it--it's his usual good job, and he's changed up some techniques. The one thing I find hysterical is the (stock) dramatic video chapter opening for things titled, "More subdivision adjustments." Hey, he's moving uptown. Still great tutorials. The best online Community for outstanding Digital Content is offering you one last chance to save throughout the MarketPlace before the month of August comes to a close! http://geekchicpc.com/info-autodesk-maya-2012-x64.html&nbsp; How about Maya 2012 for 329.95 ? http://softdept.com/pixologic-zbrush-3.5.html&nbsp; Zbrush 3.5 for 99.95 ? http://geekchicpc.com/info-rhinoceros-nurbs-modeling-4.0-sr3.html&nbsp; 129.95 for Rhino 4SR3! ETA: Despite the name this isn't a sale to clear out items. It's a sale to promote older items. Somebody needs to learn the meaning of the word "clearance" over there. 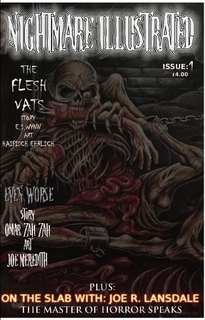 Nightmare Illustrated magazine, the new picto-fiction page-turner from Horrified Press. Special Halloween first issue. "The early reviews are in for Suzie Lockhart & Bruce Lockhart's collection of terrifying stories. 'Adventures in Horrorland' will become available to the public on October 23rd in both paperback and digital formats via Lulu.com. "ADVENTURES IN HORRORLAND is a fun-filled ride through a dark mind on a cloudy day. As this obscurity diminishes, these stories offer us glimpses into a grim world." --Kenneth W. Cain, author of FRESH CUT TALES, THESE OLD TALES, THE SAGA OF I trilogy and THE DEAD CIVIL WAR "
Released to the public today, it's a rather unique and interesting read with different styles of artwork to enjoy. I am hoping next month I will have my artwork and a little story involving my favorite psychopath Damian listed in the credits! Support the writers, artists and the still growing publishing company! Purchase one today! for $7.14 you get a printed paperback version of this unique collection! I know I'm getting one, and I'll be damned if I don't when my work is in it (Which is actually next month, but I'd suggest starting the collection now. :) )! Not 3D, but if any cat lovers out there are interested I've put together a 2014 Year Planner featuring our 12 cats. 138 pages with large colour photo for each month and a mini photo per week. Am donating €1 to Gozo SPCA for every copy sold. to "dangle that carrot" any longer. It appears to contain all 4 items offered under the "Star Fighter"
something DAZ does not offer for free otherwise. type uniform, and Aiko's morphs and maps that makes her much versatile. "best deal" I used to show new hobbyists. Addenda to above: Bill pointed out that given past history at DAZ, this deal may not remain up for long, so those who want it should get it now, rather than waiting. Heyas! Smithmicro is selling Flame Painter Pro (usually $90) for 50% off! Myself, I've been drooling over this tidbit for a long while. Save 50% on next purchase of $50 or more. This offer is NOT valid on Sale & Clearance items. Digital Tutors is having 15% off its yearly plan. That's still a chunk of change--but I watch it more than I watch TV, as it happens. Ooh! Exnem is on Flash Sale at Rendo! He has some good props. He does! I just saw that myself, but...cash is tiiiiiight. I've been using what pennies I have on the side for MR, since I've been doing this foray into purchasable characters. Just put the add out for a beta on this V4 chick. I still have the avatar pngs to make for the runtime folder and get the promos done though. It was, it was. XD I hope someone snatches up that Cintiq for you!